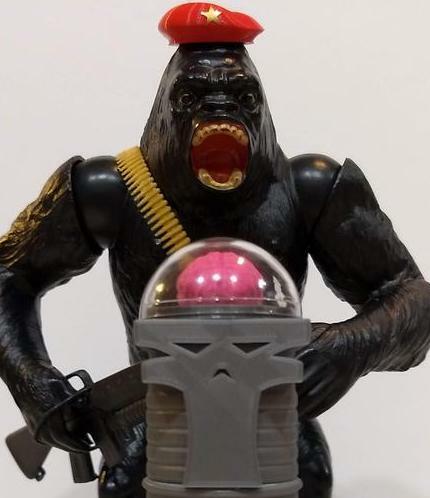 Thanks to the Mego Museum for selecting Monsieur Mallah and The Brain. as the Custom of the Week! Monsieur Mallah and The Brain. From the pages of Doom Patrol come Monsieur Mallah and The Brain. Monsieur Mallah is a french super-intelligent militant super-villain gorilla. Created by the evil scientist, the Brain, whose body was destroyed by Doom Patrol's Chief, Dr. Niles Caulder. The Brain formed the Brotherhood of Evil to get back at the Chief. 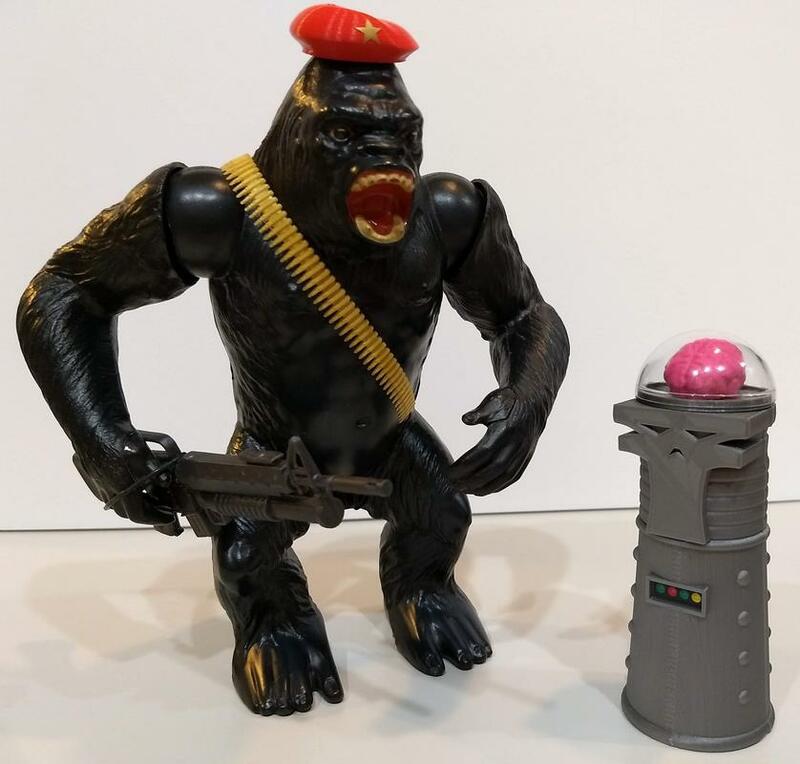 Monsieur Mallah uses the gorilla figure from the Big Jim Jungle Adventure Set, with a 3D printed ammo belt and beret with a vinyl gold star. His gun is from the 9" Hasbro Signature Series Punisher. 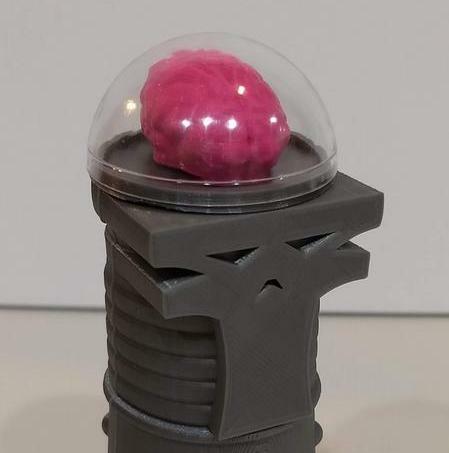 The Brain is 3D printed in silver and pink with an acrylic dome and vinyl sticker display. Here with Superman to show the scale as FTC hasn't made Doom Patrol yet. 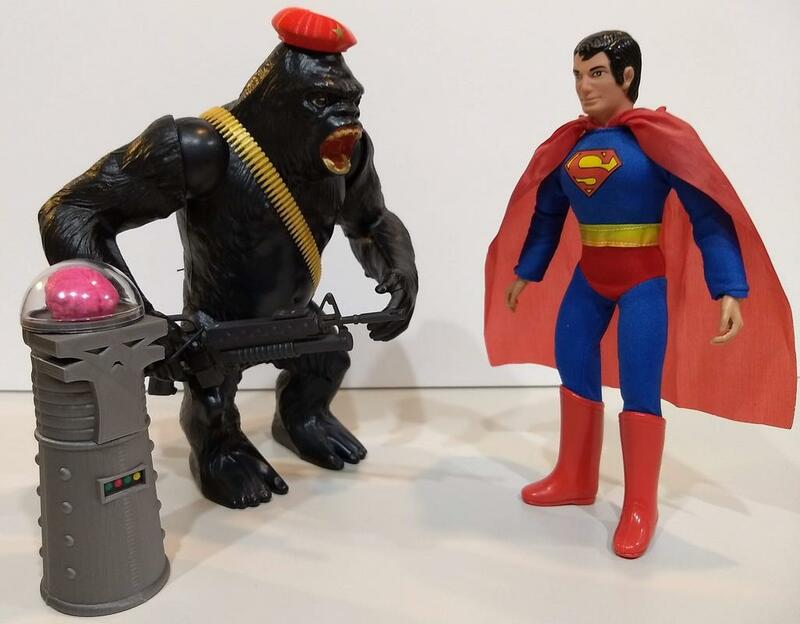 Below is a picture of a Mego bow on the right for an 8" figure and on the left is a 3D printed bow scaled up for a 12" figure. Made a cool BPRD (from Hellboy) belt buckle. I'm pretty happy with how he turned out. I think this is the first time I created a 3D head model from scratch, but making robots is easier than humans. I finally got Muhammad Ali today! I added the missing Everlast stickers. I didn't have a picture of all the onomatopoeias I had made, so here they are! I think this is one of the nicest figures the new Mego has made. If you'd like to get a set of stickers for his helmet for $2, click here. Mego is making an 8" Joe Namath figure that should be available soon. If you would like a set of pre-cut stickers, click on this link.